Double bowl topmount 20 gauge sink, complete with two stainless steel bottom grids to protect the sink from scratches. Sink features hard wearing satin finished bowls, and silk finished rims, rear drains for more storage below the counter, Spillway<sup></sup> partition between the bowls to prevent water on the counter, and a faucet ledge with 3 hole drilling. Hand fabricated double bowl stainless steel undermount sink. Zero radius corners and commercial satin finish afford ease of cleaning. Rear placed drains means more storage below the sink. Sink bowls are pitched to center of the waste holes to ensure efficient draining. Undermount template and waste fittings are included right in the sink packaging! Double bowl hand fabricated 18 gauge dual mount sink with 1 hole faucet drilling. Sink may be installed above or below counter. 12 mm radius corners and commercial satin finish afford ease of cleaning. Rear placed drains mean for more storage below. Bowls are sloped to the center of the waste holes and drain lines for more efficient draining. Includes one stainless steel bottom. Combination bowl 20 gauge stainless steel top mount sink. Small bowl, right hand position. Includes faucet ledge with 3 one faucet hole drilling. Rear drains to allow for more storage below, easy care satin finished bowls . Sink is shipped complete with and waste fittings and is backed with a Limited Lifetime Warranty. 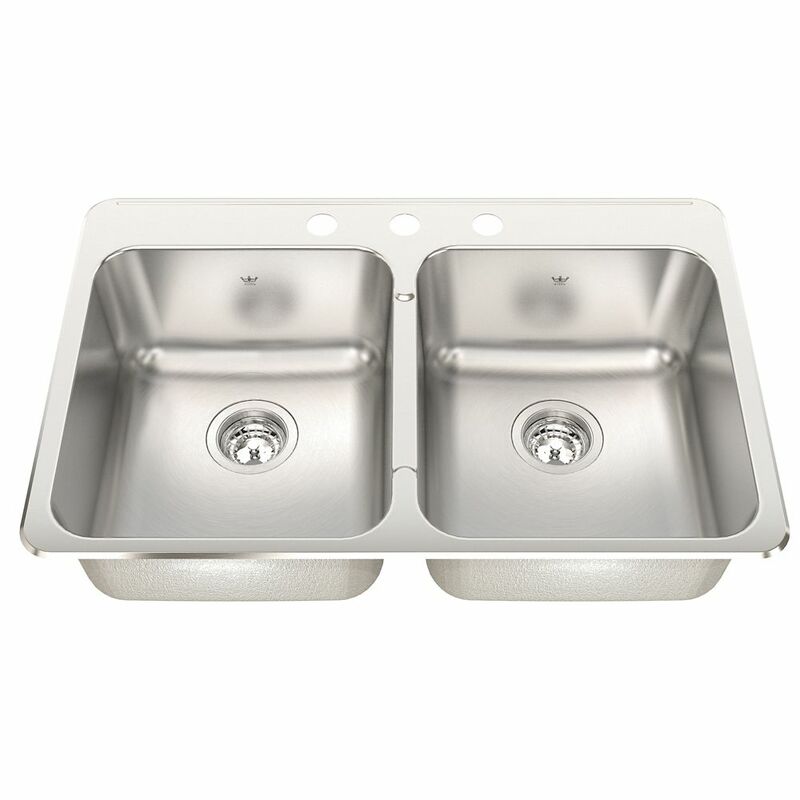 Double 20 Ga sink Silk finish 3 hole drilling Double bowl topmount 20 gauge sink, complete with two stainless steel bottom grids to protect the sink from scratches. Sink features hard wearing satin finished bowls, and silk finished rims, rear drains for more storage below the counter, Spillway<sup></sup> partition between the bowls to prevent water on the counter, and a faucet ledge with 3 hole drilling.